The Panasonic EY6432NQKW cordless drill and driver kit packs high power and control into a small package that’s easy to use for general construction, plumbing, electrical or finish carpentry work. At 4.5 lbs. 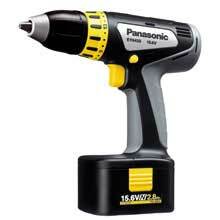 including battery, and only 8-3/16″ long x 9″ tall x 2-9/32″ wide, this cordless drill and driver produces up to 390 in. lbs. of power for demanding drilling jobs, yet its small size makes it a good tool for work in cramped quarters. Variable speed control and a reversible two-speed transmission delivers 65-450 rpm on low speed and 200-1,450 rpm in high speed. This power drill comes equipped with an 18-stage clutch and a laser-welded, fan cooled motor delivers 9 to 61 in. lbs. stepped up in 3.0 in. lbs. increments and delivers 390/in torque with dual speed range 65-450/200-1450. This power drill’s ergonomic design and rubberized grip fits well in the user’s hand and helps maintain a neutral wrist position in overhead, horizontal or floor drilling/driving operations reducing operator fatigue. The electric brake stops the bit from turning instantly when the trigger is released for optimal drilling and driving control. Using the Panasonic EY0110B charger, this battery powered drill reaches full charge in 45 minutes producing 50-percent more run time per charge and is the highest capacity battery on the market today for cordless drills. Panasonic began manufacturing professional cordless power tools in 1979. Panasonic is one of the World’s largest manufacturers of cordless tool battery and charging technology.